If you are looking for information on the PostNet franchise business opportunity, Post Net franchises or PostNet franchising, then you have come to the right place. With the combined experience of over twenty years in the franchised postal and business services industry, PostNet's founders Steven Greenbaum and Brian Spindel launched the PostNet franchise program in July of 1993 and never looked back. 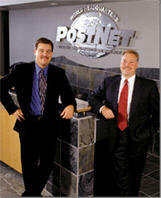 In just ten short years, PostNet International Franchise Corporation has become the fastest growing, largest privately-held company in both the postal and business services, and copy and print shop industries. Our founders attribute PostNet's initial and ongoing success to the hard work and efforts of our franchisees and the company's unwavering commitment to its culture, core values, and a vibrant passion for the business that can be felt throughout the entire organization. PostNet's franchisee-inclusive culture and open communication channels have enabled us to develop a powerful and competitive operating system fueled by the energy and enthusiasm or our franchisees, employees, and customers. It's a single, shared vision of success that inspires each and every member of the PostNet family to help each other achieve more. PostNet offers an array of high demand services and products, tailored to meet the needs of small business owners and today's busy consumer. We like to think of PostNet as an entrepreneur's store, helping the small office, home office and small business owners get what they need, when they need it. At the same time, PostNet caters to the general consumer, offering a host of products and services to help them complete their personal business needs quickly and efficiently. The growing popularity of people working from home (telecommuters) and home-based businesses has created an even greater demand for PostNet's products and services. Customers can complete their own work utilizing our equipment, or we can produce their projects for them. Either way, PostNet centers offer a full suite of services to support customers' digital needs; including Internet services, resume services, scanning, digital media storage, and digital printing. Customers can also e-mail a file or bring in a disk for easy output to the center's fully connected digital equipment. High-quality black and white and color copies are offered for self- or full-serve customers on the go, as are competitive prices for larger volumes. Because our customers want their projects to look their best, we also provide custom finishing services; including laminating, binding, cutting, folding and stapling. Additionally, PostNet centers provide full service business printing; including business cards, letterhead, envelopes, invitations, flyers, brochures, business forms, and advertising specialties. 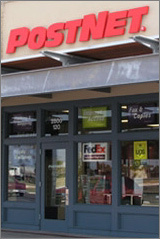 PostNet centers offer complete packaging services - from fragile and custom packaging to crating and freight. Through relationships with UPS® and FedEx®, PostNet center owners enjoy discounted rates and incentive programs geared towards enhancing profitability and increasing market share. PostNet's multi-center delivery services include priority and standard overnight, 2nd and 3rd day guaranteed delivery, and ground services. Also, international delivery services to almost any global destination. We also offer a wide variety of business and additional services; including notary services, passport photos, fax services, signs and barriers, and greeting cards. PostNet carries a convenient assortment of office supplies and a wide range of shipping and packaging products; including boxes, photo mailers and envelopes, mailing tubes, packaging tapes and cushioning materials. We also offer a wide range of shipping options through our relationships with UPS and FedEx. The Right Fit - We know that the relationship between franchisee and franchisor is critical to the long term success of any organization. We also know from experience that our most successful franchisees possess certain qualities that enable them to excel in our business. Team Player - As an extremely inclusive organization, we look for people who work well with others, openly share and participate, and want to make a contribution to PostNet's overall success. People Person - To truly embrace PostNet's culture and franchise system, a prospective franchisee must enjoy working with the public, possess strong problem solving skills and truly understand the importance of providing outstanding customer service. Attention to Detail - PostNet's franchise system has evolved through the years, based on industry experience, consumer needs, and technology. In order to take full advantage of the PostNet System, a prospective franchisee must be prepared to embrace the operational details of PostNet's best business practices. Enthusiasm - We look for people who exhibit a high level of enthusiasm and are motivated to succeed. Building a successful business takes dedication and hard work, driven by the energy and enthusiasm of its leadership. Financial Qualifications - Prospective franchisees must meet PostNet's minimum financial requirements and be in a position to capitalize the franchise investment, including working capital and personal living expenses during the start-up period. Together, PostNet and its franchisees have created a highly effective support system that inspires teamwork and the mutual success of every franchisee. Our relationship with franchisees is one of the closest in the industry because our entire philosophy is built around franchisee support and a franchisee-inclusive corporate culture. Single Unit - PostNet's single unit license grants an individual or entity the right to own and operate an individual PostNet center in an approved business location. Area Development - PostNet's area development license grants an individual or entity the right to own and operate multiple PostNet centers with exclusive development rights in a specific territory. Area Franchising - PostNet's area franchise license grants an individual or entity the right to assist PostNet Headquarters in developing a specific exclusive territory. This assistance includes providing hands-on support in recruiting new franchisees, securing new locations, coordinating the store development process, and providing local training and pre-opening support to new franchisees. On an ongoing basis, area franchisees remain available to support local franchisees and receive a portion of the total franchise fees and royalties collected in their territory. Area franchisees must own and operate their own single unit franchise and have adequate capital and resources available to fulfill their responsibilities as area franchisees. Whether you are interested in developing a single store, multiple stores, or an entire territory, PostNet has the right opportunity for you.